Have you ever been so lonely that you turned into an immortal black smudge on the wall that will never die but will also never do anything? Me neither. 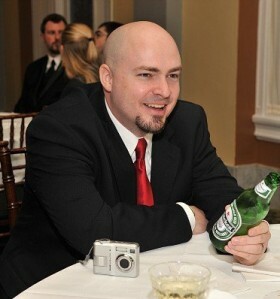 I’ve been on the Internet so long and made so many friend, many of whom I interact with daily, that it is completely alien to me the concept which people worried about for so long and worry about still, that people will just sit and stare at the PC screen, surfing the web, talking to no one, completely isolated. I suppose there is a certain kernel of truth to it, but I think it’s extremely rare. Even so, as Pulse paints a picture of people becoming separated by the world they live in and literally fading to ash it is unnerving. Although nothing is ever said for certain, it appears that wherever ghosts go when people die is full or for some other reason ghosts are pushing through into our world. After death is eternal loneliness, and the ghosts share that with people, who get super lonely and either kill themselves or become listless and eventually fade to ash. It’s happening all over the world, and, the film posits, the only people who remain are those who are okay with being alone or with being surrounded by ghosts. I guess that means if this were to happen I’d probably be okay. For a ghost story, Pulse lacks any sudden jumps or freak out scares. When ghosts appear they slowly float toward people, though occasionally they do that weird “stand in a way that people don’t stand” thing that is common to Japanese horror films. It’s like a shortcut that says, “What you are seeing isn’t a person.” It works too. A silhouette breaks from the shadows and moves toward someone. It could be anything, and then, bang! that’s not a person!! 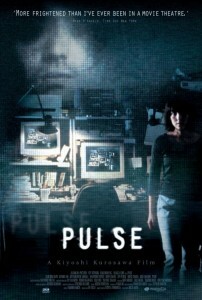 For most of its length, Pulse is a more subtle sort of film. Totally not for everyone, but I think some people will really… not “enjoy it” exactly, but will get something from watching it.